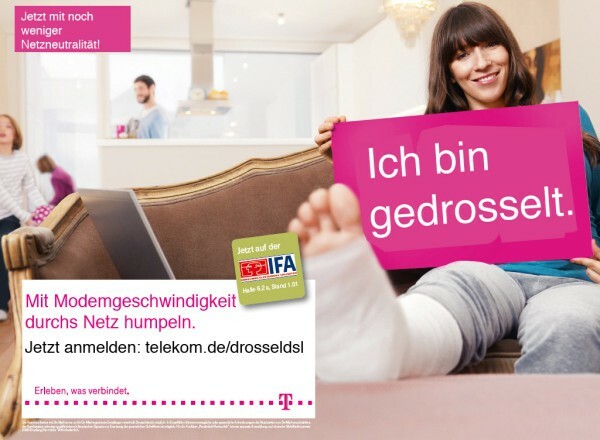 Telekom Deutschland Archives · Stop the Cap! The German Internet is functionally broken. 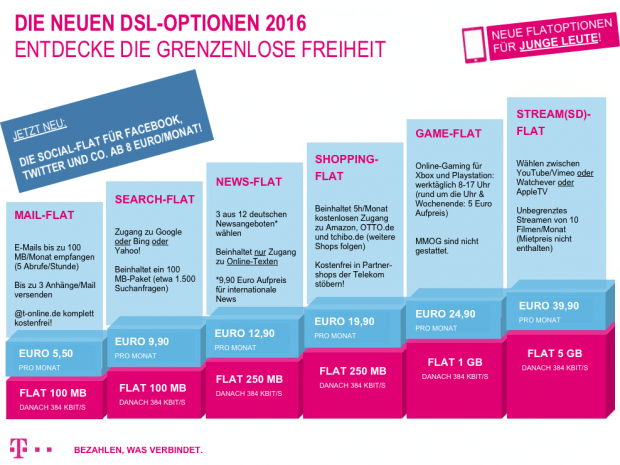 Deutsche Telekom, the largest telecommunications company in Germany, has announced it will introduce a brazen Internet Overcharging scheme for customers signing up for its broadband DSL service, including a throttle that reduces speeds to just 384kbps after as little as 75GB of monthly broadband usage. Company officials argue German broadband usage demands are accelerating at an ever-increasing rate, putting strain on the company’s network resources. But critics question if usage demands are the root of the problem, why is DT exempting itself and its “preferred partners” from the data cap, including certain services that offer very high bandwidth video? The group points out DT has admitted the speed throttle only applies to content providers who have not partnered up with the German telecom giant. DT is exempting all of its own in-house content providers, the private television service Entertain, and telephone services (when provided by DT). For everyone else: the speed throttle gets closer the more customers use services like Apple iTunes or Amazon’s Lovefilm service. But DT says those companies can also get special treatment for the right price. DT’s preferred partner cooperating agreements let “high quality content producers” pay for a managed services contract that guarantees exemption from the speed throttle and prioritization of their traffic on DT’s network, even if it means slowing down non-preferred partner content. A parody future offer from DT. Technology publisher Heise Online says the new usage restricting tariff has “triggered a veritable sh**storm” among net users who consider a 75GB usage limit untenable, particularly for families with multiple Internet users. Heise is also critical of claims DT has made in the press that suggests German Internet users must either accept the usage caps or understand the company will have to spend at least €80 billion ($108 billion) to build a national fiber network to manage growing traffic. In contrast, Goldman Sachs last year estimated the cost of wiring every home in the United States with Google Fiber would cost $140 billion, a number now considered inflated. Verizon FiOS managed to get costs down for its own fiber network to a level that suggests Google would only need around $90 billion — $10 billion more than DT claims it needs. DT has also received criticism for how it has depicted its heavy users — mostly as content thieves and software pirates using file swapping networks to steal copyrighted works. But instead of dealing with copyright violations, DT wants a sweeping usage cap system that punishes every customer that wants to use their broadband connection. When throttled, customers will need more than 23 hours to watch a DVD-quality movie. At Blu-ray resolution, it will take about two weeks to watch just one film. […] The implications of the end of Net Neutrality in Germany represents a form of economic censorship, and German politicians are standing by to watch it happen. The federal government sees the Internet as a political bargaining chip and not as the social, cultural and economic tool it represents. The government acts in the interests of certain lobbyists, not Germany’s digital future. This allows German telecommunications companies to focus on their economic self-interests without government policies that demand investment in digital infrastructure. A number of German Internet users are expected to switch to a cable provider, where available, to escape DT’s impending speed caps. According to the Frankfurter Rundschau, many German cable companies also reserve the right to limit speeds for customers. 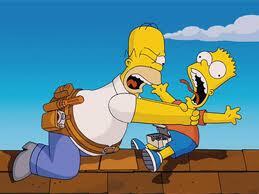 But in practice, most don’t impose limits until traffic exceeds 60GB daily, and the speed cap is lifted the next day. A cable industry official says its cap currently impacts about 0.1 percent of customers, almost all who use peer-to-peer file swapping networks. Exempt from measurements that bring customers closer to a speed cap: web browsing, video streaming, and video-on-demand. For now, Germany’s cable operators facing the same traffic growth DT speaks about find no need to impose further limits, stating their networks are handling the traffic with network upgrades as a normal course of business.